An instant coffee blend and roasted and ground coffee. Now Lavazza Prontissimo! brings you the real Italian taste in an instant. Much more than an instant coffee, Prontissimo! 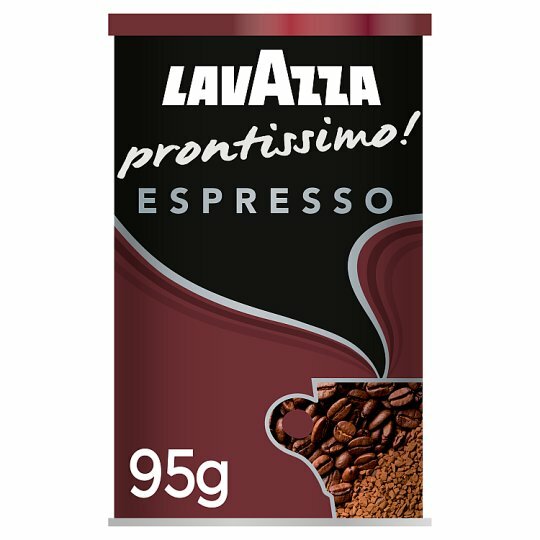 is an extraordinary blend enriched with selected Arabica and finely ground coffee, for an authentic Italian taste experience. Everything we love in espresso: lingering crema, long-lasting and intense flavor. This is the new Prontissimo! Espresso. Since 1895, four generations of the Lavazza family have devoted their lives to the pursuit of coffee perfection. True Italian coffee taste: our passion, your pleasure. Preparation: simply add hot, but not boiling, water to 1-2 teaspoons of coffee in your cup. Try it with hot milk!